"There is more news this week of the crises hitting the major companies involved in the housebuilding industry. Its shareholders are losing confidence and there is worrying news that Barratt's share price has crashed.Following a deal between the Hackney Council and the Greater London Authority, Barratt has commenced building 550 towerblock flats for sale in Dalston. 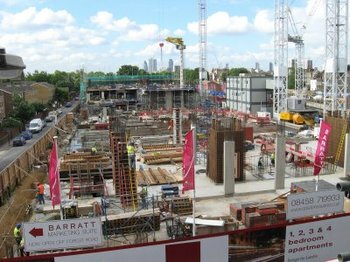 Although the precise terms of the deal with Barratt are the subject of commercial confidentiality, reports to Hackney Council's Cabinet indicated that Council taxpayers would take some of the financial risk on the project. With the slowdown in the housing market the prospect of the Council getting our money back appears to be diminishing." "The Financial Services Authority is closely monitoring the house building sector as the value of the big construction firms continued to shrink today. Britain's bruised and battered housebuilders suffered another torrid day on the stock market after Merrill Lynch warned that the housing market could face a repeat of the 1990s crash. Some £5bn has been wiped off the value off the big builders, including Persimmon, Barratt Developments and Taylor Wimpey since the beginning of this year. Many analysts believe the firms, which have lost £15bn in value since last summer, are close to breaching their banking agreements." For more on Barratt, read on.